and navigate to Settings> Registration. 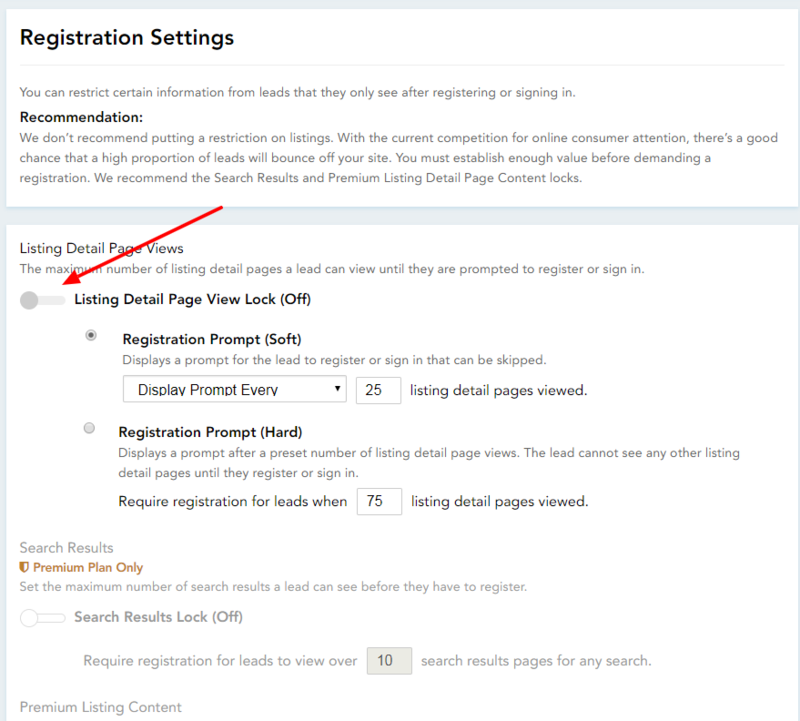 Toggle the "Listing Detail Page View Lock" to "On". When you choose an option it will display its settings options. The description provided in the settings is very straightforward, but let's take a look at each one so that you can decide what you would prefer to activate. This option is the default one and it has no deeper settings. It is not going to require the user to register when browsing the listings. With this option activated the users still have the option to sign up if they want to save searches or "love" a property. They could also click the link "sign up" on top of the search box. 1. Display Prompt Every X listing detail pages viewed. 2. Display Prompt Once When X listing detail pages viewed. This has the same functionality than the 'Soft' one, but it doesn't give the user the option to skip, so if they want to keep browsing the listings, they must sign up. This can be good as it would collect the contact info of a potential lead, but it can also be a bit risky as people could just leave the site. It's up to you setting this up and testing how it works for your goals. After you've decided what option you would like to enable, do not forget to scroll down to the bottom of the page and save the changes. You can test these options and see how they work for your site, what performs better and how many people sign up. This configuration can also be disabled at any time. If you need assistance for setting this up, feel free to contact our team.